You may also be interested in Writing the Walk: A Workshop with Oxeye Press Poets, May 20, 10:30 am-12:30 pm. Poet/birder Chuck Stebelton returns to Lynden for spring bird walks, and he's brought friends! Please wear appropriate footwear and bring your binoculars if you have them; no previous birding experience required. Chuck Stebelton is author of two full-length collections of poetry, most recently The Platformist (Cultural Society, 2012). His first book, Circulation Flowers (Tougher Disguises, 2005), was winner of the inaugural Jack Spicer Award. 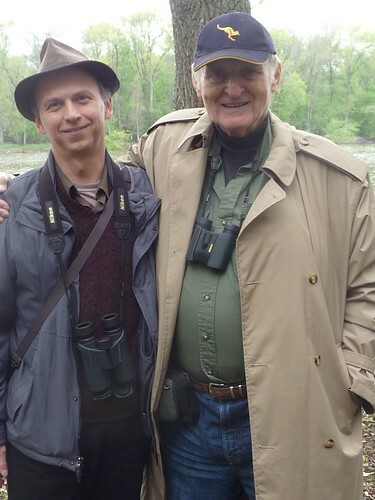 As a birder and Wisconsin Master Naturalist volunteer he has offered interpretive hikes for organizations including Lynden Sculpture Garden, Friends of Lorine Niedecker, and Woodland Pattern Book Center. He was Literary Program Director at Woodland Pattern from 2005 to 2017. He currently serves as Program Coordinator for Interfaith Older Adult Programs in Milwaukee and is a participant in Lynden's residency program. On April 29, Stebelton's guests are artist Katheryn Corbin, whose exhibition Migrant will be on view at Lynden from February 25 through May 27, and Kiki Anderson. Kiki translates from French to English for various publishing houses and Dr. Yann Rougier, a noted health and wellness expert. She also teaches English as a foreign language to Catholic priests and seminarians. She enjoys the great outdoors and is excited to discover the birds at Lynden with Chuck. On May 20, Stebelton's guest is Renato Umali, an artist, musician and educator. Umali composed the score for artist Cecilia Condit's two-channel video installation, Tales of a Future Past, part of a recent exhibition at Lynden.